This post contains affiliate links. They help pay the bills! 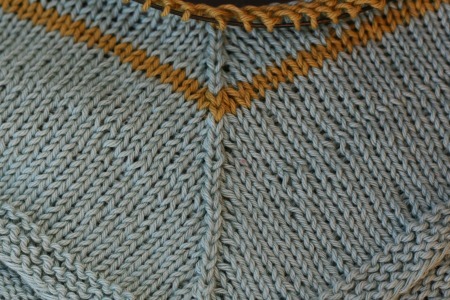 I’ve been knitting/designing a summer tee with CotLin yarn. And I love it. As soon as I put my hands on this yarn I was certain it would make a nice summer-weight garment. The more I knit on this little pullover the more certain of that I am. That version no longer exists because it all got ripped out. It was 8 stitches too big you see. 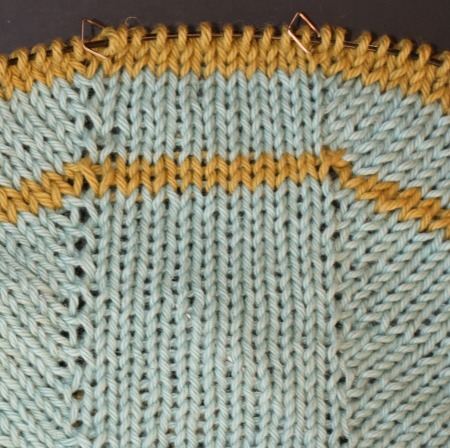 I can fudge a lot in my knitting but eight stitches, when your gauge is 5.5 stitches to the inch, is a lot of fudge. I wasn’t sure how I could have messed up my cast-on count that badly but in the end there was only one solution: rip it and re-start. I was clicking my way through Version Number Two when I realized I had messed up my increases. I was doing Make One Lefts where I needed Make One Rights and so on. After ten rounds of me wondering why my stitches looked all funky I realized the problem. Now I’m far from a perfect knitter but this is unusual. I hardy ever make two bonehead mistakes back-to-back. I usually manage to spread my boneheaded-ness out. Even so there was nothing for it. I was back to the original solution: ripping. I think after that I continue on, sleep-knitting and… that’s when mistakes happen. Lesson learned! Apparently I can’t knit in my sleep. 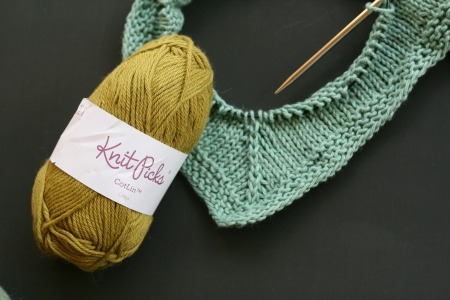 That surprises me a little because I can manage simple knits with my eyes closed and I do spend many nights dreaming about knitting (yes my addiction is deep). Even so sleep-knitting seems to be beyond my abilities. And this CotLin yarn is so easy to work with, and feels so nice on the needles, that its putting me to sleep. Beware the Cotlin. Its too relaxing. Only knit with it when you are wide awake and have five or six cups of coffee racing through your blood stream. But I do love this yarn. Last week I ordered another ball of it because I wanted the see how a third color would look in my tee (and because I like getting yarn). I just have to stay awake long enough to get some mistake-free knitting in. I think I’ll go put on a pot of coffee and do a few rounds of knitting. If you hear me making those pig-snorts please come take the yarn out of my hands. Because I had room in my yarn closet → ← Want to go to the Local Yarn Store with me? 14 Comments on "Some Relaxation with my In-Progress Summer Tee"
I’ve left my share of “design elements” as a result of sleep knitting, too. You’d think I would learn! But no…I keep knitting when I’m tired. On another note…your tee is looking lovely! I look forward to the finished product! And thanks! My tee will come together. I don’t promise that there will be no more ripping. But eventually I’ll get there. It is very nice stuff! Enjoy. And enjoy deciding on your future yarn orders. That’s half the fun. Such good advice. I could promise to remember to check all my knitting upon waking but… we all know that won’t happen. I’ll just pick it up, start knitting and pay the price later. OMG Jenn !!! You are SO FUNNY !!! I nearly did a pig snorts with my iced coffee coming out of my nose, when I was reading the blog this morning !! You sure do know how to bring joy into our dreary days. Thanks so much for that. Now, on the topic of your summer tee… it is lovely ! I think you have chosen the perfect colours for your skin tones. I hope you finish it, and get to wear it at least once this summer. Happy knitting to all ! I hope I get this done while it is still warm too. I’m certainly going to try. Be careful with that coffee up the nose. Its not good for your nose or your dignity. You’ve illustrated sleep knitting and pig snorting beautifully, er make that eloquently. Happens to me all the time as I tend to knit late into the wee hours well past a reasonable persons reasonable bedtime. And you make me laugh so hard! “In stitches” ha! I love puns. I really do make pig snorts when I start snoring. I should just be sensible and go to bed when I start yawning. But I need some knitting time, you understand I’m sure. And I need a summer tee so I’ll just press on and home I get better at sleep knitting.